Nickel is a metal that's used in a wide variety of products including jewellery, belt buckles and watch straps and is so widely used that nickel allergy is the most common form of allergic contact dermatitis in the developed world. 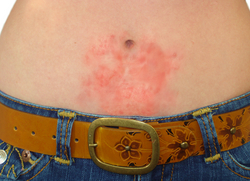 Nickel allergy often shows as a dry or blistering itchy skin rash at the site of contact, for example, itchy rashes on the earlobes from earrings, on the back of the neck from a necklace fastening, the wrist from a bracelet or wristwatch, or near the "belly-button" from a belt buckle or the rivets on jeans. More recently, there have been reports of mobile phones causing facial rashes as a result of nickel allergy. The diagnosis may be less obvious in black skin but hyperpigmentation frequently accompanies eczema of all types in brown and black races. This patient had contact dermatitis to metal (nickel) in the frames of his spectacles which rested on his cheekbones. Less commonly, nickel allergy causes a rash all over the body as a result of nickel being eaten and absorbed into the body. This has been reported to occur from orthodontic braces, tongue piercings, nickel leaching into food from old pots and pans, and even eating foods containing high amounts of nickel. Foods that contain high amounts of nickel include legumes, leafy green vegetables, and various nuts and seafood but only cause problems in highly sensitive people with nickel allergy. Why Does Nickel Allergy Occur? Nickel allergy may occur at any time during a person’s life, even when symptoms didn’t appear in the past. A person may have become allergic after being exposed to a large amount of nickel or after a nickel-containing material came into contact with broken skin (such as a cut or sunburn). A person’s tendency to react to nickel is probably genetic, meaning that nickel allergy probably runs in families. There aren’t any medicines you can take to stop you being allergic to nickel but your doctor may prescribe a mild steroid cream or ointment, such as 1% hydrocortisone cream, to clear up the rash and reduce itching. The main way to prevent a rash starting once you have become sensitive to nickel is to avoid coming into prolonged contact with anything made of it. Test anything made of metal with Nickel Alert to find out whether it contains nickel. Wear cotton gloves if you need to handle anything made of nickel at home or work or rubber or PVC gloves with cotton gloves as a liner for any wet work. Latex-free Magic Touch single use gloves can be useful here too. Where it isn’t practical to wear gloves a drop of the excellent Gloves in a Bottle shielding lotion will act as a barrier. Jewellery and watches can be brushed with a layer of Nickel Guard to protect the skin or you could consider wearing a watch with a plastic or fabric strap. Change the metal studs and rivets on your jeans and buckles on your belts or buy a No-Nickel belt that's guaranteed nickel-free. NB Gold plated and 9ct gold jewellery can contain nickel; 18 and 24ct gold does not contain nickel. Titanium razor blades are nickel-free.